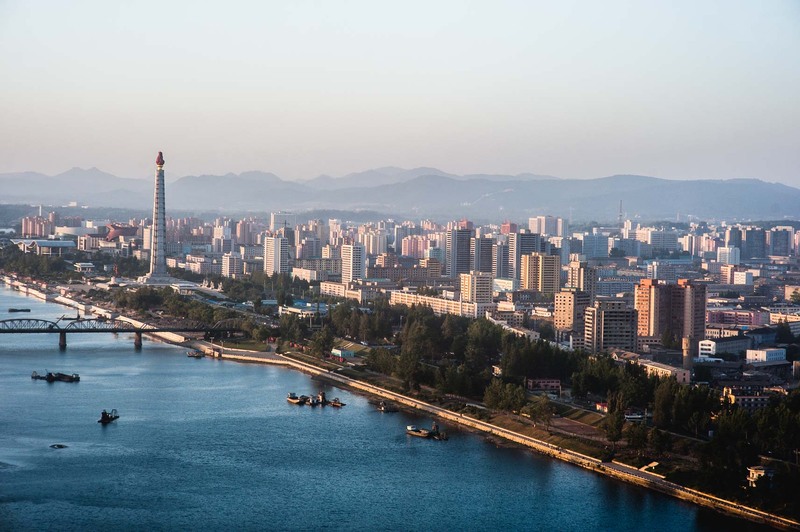 View of the river Taedong and the Juche Tower (with flaming top), a monument representing the ruling party's Juche ideology, stating that the individual is "the master of his destiny" and that the North Korean masses act are to act as "masters of the revolution and construction". Wikipedia backgrounder: Pyongyang was reduced to rubble during the Korean War and has been entirely rebuilt according to a design reflecting Kim Il-Sung's vision. His dream was to create a capital that would boost the morale and ego of Koreans in the post-war years. The result was a city with wide, tree-lined boulevards and monumental public buildings with terraced landscaping, mosaics and decorated ceilings. — in Pyongyang, North Korea.